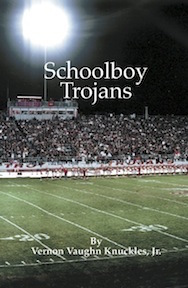 Schoolboy Trojans by Vernon V. Knuckles, Jr.
by Vernon V. Knuckles, Jr. The Class of 1963 of Troy High School meets for its fortieth reunion. We again reminisced about our rocking and rolling school boy (and schoolgirl) adventures in Troy long ago. The last of innocence. The Beatles had not yet arrived. Dwight D. Eisenhower, John and Bobby Kennedy and Dr. Martin Luther King, Jr., were all still with us. When I occasionally see former classmates, they seldom discuss their lives following graduation- not the college years, professions, marriages, children, divorces, travels, illnesses, retirements or death of friends. They want to talk about the good old days. Our years together in Troy were so action-packed, fun-filled and intense that we're doomed to relive them until we die. Perhaps, once I have expurgated all of these past Troy tales, I can get on with living my life forward instead of backward. One thing is certain: I was compelled to write Schoolboy Trojans. I was at the vortex of those maelstrom years- especially when the chicanery began. So, for all my homeboys, I hope I get it mostly right. I avoided your real names and stuck with the nicknames I made up for you back in the days.